International Education Week (IEW) is a joint initiative of the U.S. Department of State and the U.S. Department of Education that promotes international exchange and a global learning environment. In November 2018, EducationUSA Pakistan celebrated IEW by holding a series of 13 interactive and informative events for over 3,000 students in Islamabad, Lahore and Karachi. These IEW events were designed to reinforce the importance of academics, encourage self-expression, and inculcate leadership skills, discipline and teamwork, through various art and sports activities. The events also provided an opportunity for students to network with U.S. alumni and U.S. citizens to gain an international perspective on what student life in the United States might be like. 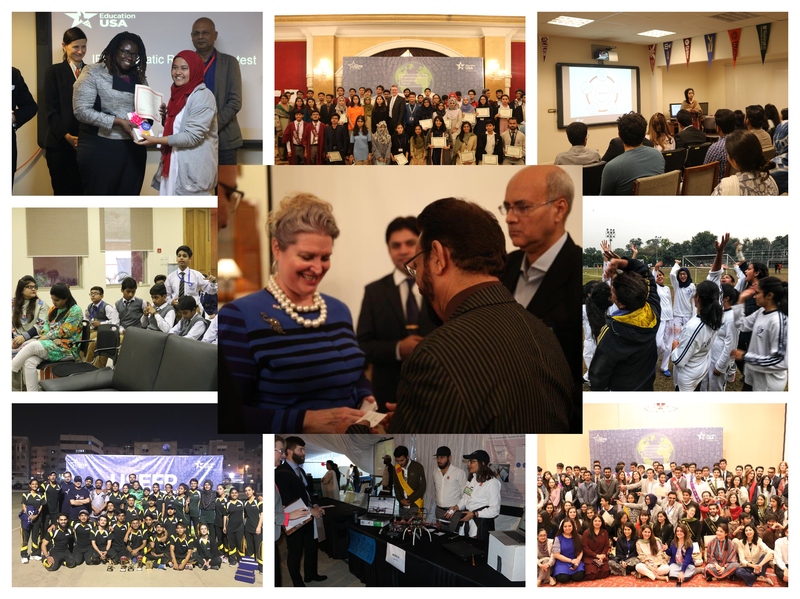 In keeping with its tradition of recognizing and rewarding commitment to U.S. higher education, EducationUSA hosted High Achievers Ceremonies in Islamabad, Lahore and Karachi. Keeping in mind the important role of high school counselors in encouraging students to apply to U.S. colleges and universities, the ceremony also honored counselors in three different categories: Students’ Choice Award, Counselor of the Year, and Most Promising Counselor. Extra-curricular development is a vital pillar of international education, helping students in cultural integration, improving social skills, and earning career experience. Therefore, IEW featured sports competitions, performance art contests, and community service initiatives, bringing home the idea that getting accepted to an American college or university is about more than just grades and test scores. To encourage the budding athletes of the country, EducationUSA Islamabad sponsored a weeklong sports tournament in collaboration with the Islamabad College of Arts and Sciences (ICAS). Over 1,600 student athletes competed in six different sports – football, basketball, table tennis, cricket, badminton, and snooker. 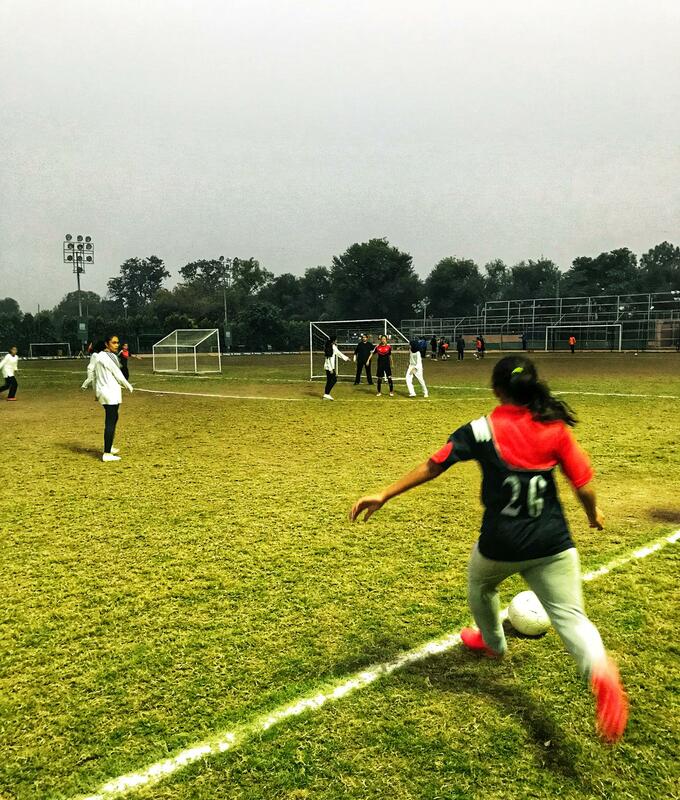 EducationUSA in Lahore organized the first-ever girls soccer tournament bringing together all-girl teams from five school campuses. In Karachi, EducationUSA held the most successful edition of the USEFP Cricket Tournament, involving 350 student athletes. As in previous years, audiences in Islamabad were enthralled as students unleashed their inner artists during the Dramatic Reading Contest. About 40 students put on a splendid display using intonation, expression, and emotion to give life to poetry, prose, song lyrics, and famous speeches. Some more ambitious and creative students also recited their original works. Critically-acclaimed author, Harris Khalique, served on the judges’ panel along with guests from the U.S. Embassy, who awarded prizes for first, second, and third place. EducationUSA Islamabad also hosted its first ever Science Fair in collaboration with Headstart School. More than 20 student teams participated in the science fair and showed off their scientific acumen through real-world applications of scientific concepts and knowledge. The student projects featured in the fair included a solar-powered air-conditioner, a wi-fi based system for controlling household systems like heating and lighting, and a home-made quad copter featuring gyroscopic flight stabilization. The science fair was attended by judges from the U.S. Embassy and over 200 students from different campuses. Promoting civic engagement and community service is a core principle espoused by EducationUSA in Pakistan. Throughout the year, many events are organized with this in mind. This year, EducationUSA took advantage of IEW to host the finale of their Act Youth Force community service project in Lahore. As part of the project, student volunteers worked on ‘Personal Development and Career Counseling’ with their peers from underprivileged schools. Similarly, in Karachi, EducationUSA organized a blood drive in collaboration with the Fatimid Foundation. For the first time ever, EducationUSA Lahore featured EdUSA Talks, modelled on the famous TED Talks. The event featured three speakers: Fulbright scholar, roboticist, and faculty member from ITU, Talha Rehmani and Lala Rukh and Omar Zaman, who spoke about “Women in STEM fields”, “Breaking the Barriers” and “Finding Your Spark”. The event was attended by 150 people including Public Affairs Officer from the U.S. Consulate in Lahore, Michael Guinan. In Karachi, EducationUSA served its large community of U.S. alumni and U.S. citizens with a networking event for about 100 U.S. alumni and local HEI representatives at the residence of the U.S. Consul General, as well as an in-house session focused on how Pakistani-American students who are U.S. citizens can go about pursuing higher education in the United States. This year’s IEW celebrations in Pakistan were a resounding success. The events drew large audiences and participants, demonstrating a growing interest in international education opportunities, especially in the United States. According to the 2018 Open Doors Report on International Educational Exchange, the number of Pakistani students in the United States increased for the sixth consecutive year, going up by 7.4 percent to reach a new high of 7,537. USEFP operates EducationUSA Advising Centers in Lahore, Islamabad, and Karachi, which are part of a global network of hundreds of advising centers in more than 170 countries around the world supported by the U.S. Department of State. All of USEFP’s EducationUSA advisers have first-hand experience of studying in the U.S. and provide accurate, comprehensive, and current information for no cost about how to apply to U.S. colleges and universities through one-to-one advising sessions, and various programs and events addressing the application process. Previous PostBridging gaps: USEFP holds its 2nd Annual Humphrey ConferenceNext Post USEFP celebrates inspiring UGRAD grantees as they depart for a semester to the U.S.